Tahiti is a tropical and luminous salmon orange. Shipped as bareroot tuber. Exclusive. Blackmore & Langdon Tuberous Begonias from England are a treasure beyond description. People come hundreds of miles to see our greenhouse display. The plants' luminous colors, exquisite shapes, and long season of bloom put lesser strains to shame. These varieties are not offered elsewhere in America and almost always sell out. Please order early. Tuberous Begonias offer spectacular flowers in a wide range of colors over an exceptionally long season, and do all this in shade. In the North, tubers should be started indoors in late winter or early spring to bloom by summer. They need well-drained soil, indirect light and moderate temperatures; these are not plants for the Deep South or the desert Southwest. For timely planting, we recommend early orders, which start to ship in March. Plant 1 tuber per 7–12″ pot. 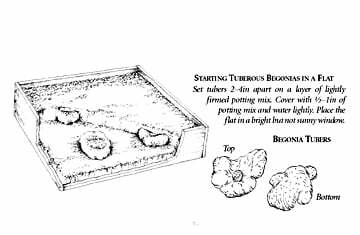 For more information on growing Tuberous Begonias, click Growing Guide. B&L Begonias Luscious/Unique. Worth It! I bought a few B&L's several years ago and lost them in a move. They were outstanding in every way and almost completely care/bug free. The blossoms got so large that my Tahiti would trail over the sides of its large hanging basket. You will find the flowers to be super delicate-looking as you can almost see through them, but they are pretty hardy. (Watch out for strong wind days and hot drying sun.) They will do well in the house for a week or so if you want to add a special indoor touch (away from direct AC currents). Then I'd take it back out to its bright shady 'home' and bring in another. Tahati was simply glorious. Try one - you'll become addicted! I've just now purchased three more B-L's and can't wait to get started. Tuberous Begonias are frost-tender plants that thrive where they receive bright light but little or no direct sun. Given an early start, they put on a glorious display all summer long. We grow our Begonias in pots and hanging baskets, but they can also be planted in the ground (once the danger of frost has passed). Either way, unless you live in a frost-free climate, you must lift and store the tuberous roots in fall to carry the plants through winter. To get a jump on a short season, plant tubers on arrival in flats (shallow containers with drainage holes) or 4–5″ pots. The potting mix should have a light texture and be well drained; a soilless mix, mixed 3 to 1 with builder's sand, meets both requirements. Begin by placing potting mix and sand in a plastic tub or bucket. Slowly add water and stir until the mix is moist but not soggy. Put moistened mix in the container, stopping about 1½″ shy of the rim. Handling the tubers with care (especially if they have begun to produce new growth, which is very fragile), place them, hollow side up, on top of the potting mix. Space the tubers 2–4″ apart in a flat (one tuber per 4–5″ pot) and cover them with ½″ of potting mix. Then water sparingly and place the container in a window that provides bright but indirect light. Keep the potting mix moist but not soggy. To hasten growth, set the container on a heating mat or a radiator (with a few magazines between container and radiator to prevent overheating). Tubers that have not already begun to sprout when you receive them will generally show signs of growth within 2–6 weeks after planting. 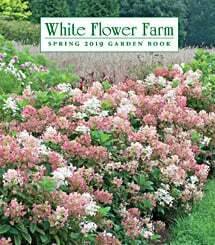 After the first 2 leaves have emerged, transplant tubers started in flats into 4–5″ pots or, provided the danger of frost has passed, into a lightly shaded outdoor bed that has been amended with organic matter such as compost or peat moss. Lift and move the tubers carefully to avoid damaging the roots, and set the top of each tuber 1–2″ below the surface of the potting mix or garden soil. Begonias planted in the ground should be positioned so that the points of the leaves aim at the viewer, because the blooms will face the same direction. Plants in 4–5″ pots should be moved into 7–10″ pots when the roots fill the pots. If time and energy permit, a final move to 12″ pots will yield especially spectacular plants. Set pots outdoors in a bright but not sunny location when the threat of frost has passed. Tuberous Begonias will not grow well in deep shade. When upright varieties are 4–6″ tall, push a heavy, 18–20″ long bamboo stake (or one of our cushioned, steel Begonia Stakes - Set of 5) into the potting mix or garden soil on the side of the plant opposite the points of the leaves. Place the stake a few inches away from the main stem to avoid injuring the tuber. Fasten the plant to the stake with garden twine or soft plastic tape looped in a figure-8 around stem and stake. As the plant grows, you may need more ties to provide additional support. Tuberous Begonias thrive in soil that is evenly moist but well drained. Soggy soil can cause the stems to snap off at the base. Fertilize plants once a month with a balanced (20-20-20), water-soluble fertilizer mixed as directed. Keep plants tidy by removing spent flowers; cut the flowers off close to the stem using a sharp knife. The only disease that may trouble your plants is powdery mildew, a fungus that appears as white powder on the leaves. Powdery mildew is easier to prevent than it is to cure, and placing your plants in a location where air can circulate freely around them is the best prevention. If you've had trouble with powdery mildew on Tuberous Begonias in the past, you can prevent future outbreaks by spraying with a mild fungicide that you can prepare yourself by mixing one tablespoon of baking soda and 2 or 3 drops of insecticidal soap in a gallon of tepid water. Spray this solution every 10 days during hot, humid weather. Once mildew appears, the only effective remedy is to spray promptly with a commercial fungicide. Follow the directions on the label carefully. Allow plants to grow through November (or until frost) to store energy for the next season. Force container-grown plants into dormancy by gradually withholding water. Dig plants grown in the ground with a ball of soil and let them dry out in a shed or on the garage floor. When the stems break free from the tubers, shake off excess soil and allow the tubers to cure in the sun for about 4 days. Then store them in dry peat moss or sand in open flats in a cool (45°–50°F), dry place. Replant the tubers as suggested above in late winter. Hanging Basket Begonias—varieties with trailing stems—require much the same care as upright Begonias, except that they look their best in a shallow container that can be suspended from the eaves of a house or from an arbor. One Hanging Basket Begonia tuber in a 12″ container makes for a spectacular and long-lasting display. Please note: If the stems of a Hanging Basket Begonia grow upright and refuse to trail over the edge of the container, plants are not receiving enough light.